Though most beaches prohibit glassware, sometimes shards of glass along with broken sea shells and other debris can be lurking in the sand waiting to be stepped on. Always wear protective footwear. If you do get a cut on your foot, clean the wound with soap and apply a first aid ointment. 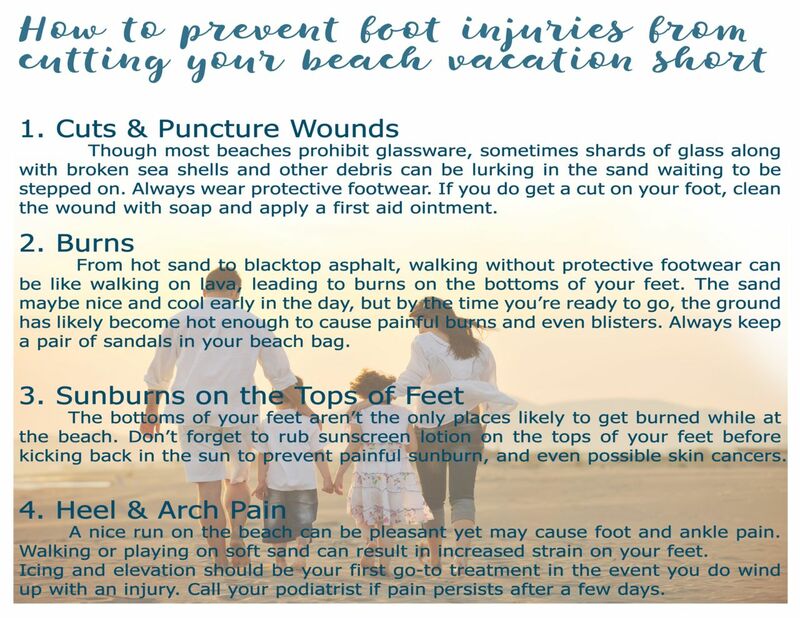 From hot sand to blacktop asphalt, walking without protective footwear can be like walking on lava, leading to burns on the bottoms of your feet. The sand maybe nice and cool early in the day, but by the time you’re ready to go, the ground has likely become hot enough to cause painful burns and even blisters. Always keep a pair of sandals in your beach bag. The bottoms of your feet aren’t the only places likely to get burned while at the beach. Don’t forget to rub sunscreen lotion on the tops of your feet before kicking back in the sun to prevent painful sunburn, and even possible skin cancers. A nice run on the beach can be pleasant yet may cause foot and ankle pain. Walking or playing on soft sand can result in increased strain on your feet. Icing and elevation should be your first go-to treatment in the event you do wind up with an injury. Call your podiatrist if pain persists after a few days.